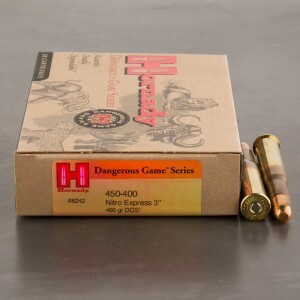 The 450/400 ammo comes from a family of cartridges with projectiles sizes between .405 and .411. These cartridges are designed with rimmed, bottleneck cartridges ideal for large single and double shot rifles. The 450/400 Nitro Express family varies greatly within its actual case size. It’s best to think of the round the way people think of different shotgun gauges. The 12 gauge has a wide variety of sizes, from 2 ¾ up to 3 ½ with some odd ball 2 ½ thrown in by the South Africans. They are different sizes but all considered 12 gauge. The 450/400 Nitro express fires a .405 or .411 mm round, which required the necking down of the original 450 Express cartridge. A powerful load, these rounds are capable of hunting some of the largest game in the world, including dangerous game. The caliber has stout recoil, magnified when fired from light rifles. The muzzle velocities do vary per loading of the 450/400 Express, but the average load can push a 400 grain round at 2,100feet per second.